The winners were judged by a panel of experts. Laura Rawlings from BBC Radio Bristol announced the winners, and was joined on stage by Marcus Trescothick MBE. The winners were all presented with individually crafted, hand inscribed awards by Will Shakspeare, from Shakspeare Glass in Langport. This award reflects the hard work and dedication of the many volunteer and paid staff that work tirelessly to deliver a memorable day for all our passengers. 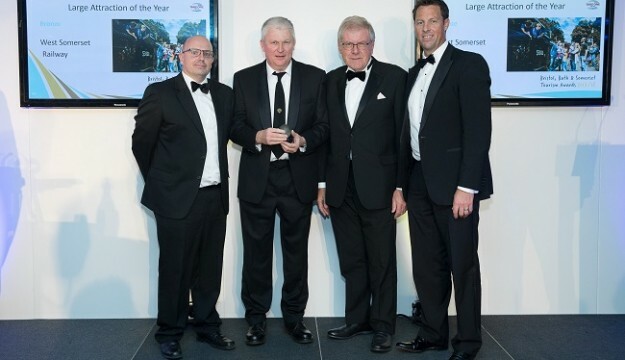 The West Somerset Railway congratulate the winners in this category of the Gold Award Wells Cathedral, Silver Award Hestercombe Garden Trust and our joint Bronze winner The Roman Baths & Pump Room.